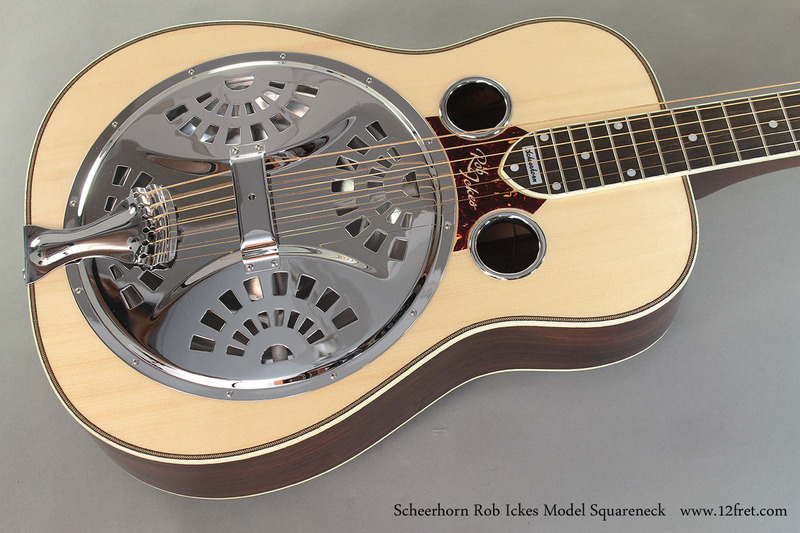 Now this is just lovely – a brand-new Scheerhorn Rob Ickes Model squareneck resophonic guitar, built by National Reso-Phonic in San Luis Opisbo, California. 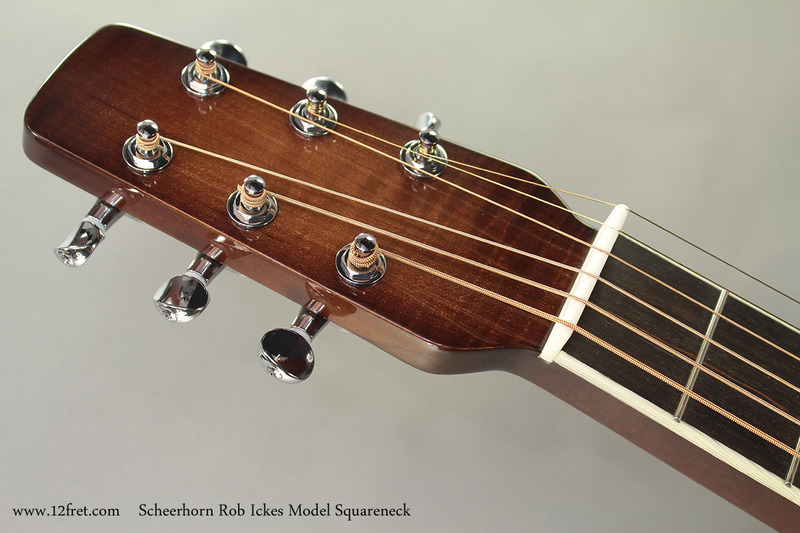 The Scheerhorn Rob Ickes model features all the unique Scheerhorn advancements, including the modifided soundwell and reflector baffle, that make this guitar design work so well. 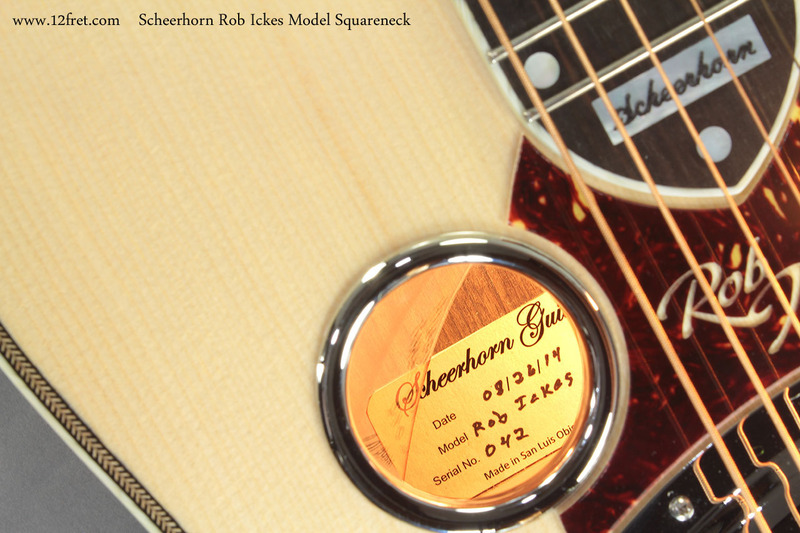 The Scheerhorn L-style body typically uses a spruce top (laminate reinforced for strength as required) and Indian rosewood back and sides with a flame maple, 25 inch scale square neck with ebony fingerboard, mother of pearl dots and a mother of pearl Scheerhorn logo at the end of the fingerboard. The ebony is not completely black, but has delicate brown grain visible; to our eyes this adds a lot to the appearance of the fingerboard. It actually LOOKS like wood, and we are sure that this will become much more common, because it reflects a significant reduction of waste during harvesting. Until recently, ebony was selected for pitch blackness, and this meant that any boards showing any variation were simply discarded. 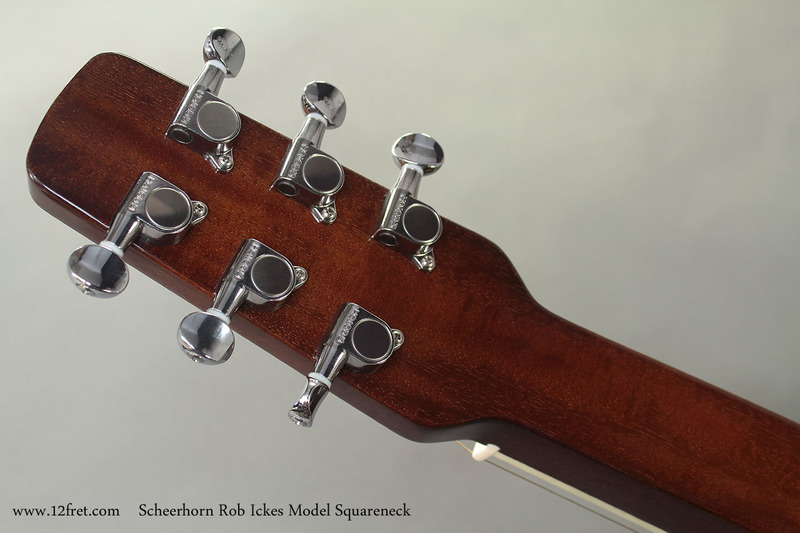 And, credit where it’s due: Bob Taylor, of Taylor Guitars, recognized this as a problem and took steps to improve the situation. The body and neck are bound with a grained ivoroid plastic and the top also has a layer of herringbone purfling. 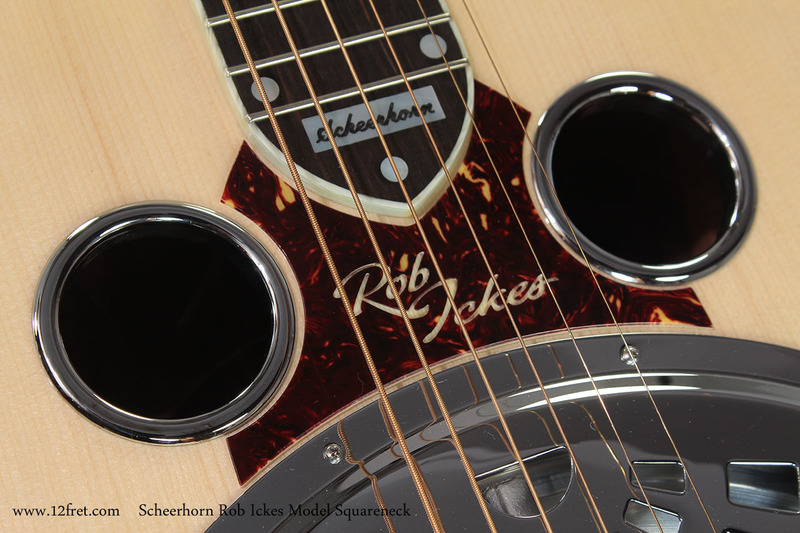 Between the end of the fingerboard and the resonator cover, there’s a faux tortoise-shell pickguard engraved with the Rob Ickes logo. The vibrating heart of this instrument is is the hand-spun Scheerhorn cone, cast spider and ebony-capped maple bridge. This resides under a traditional fan cover plate. 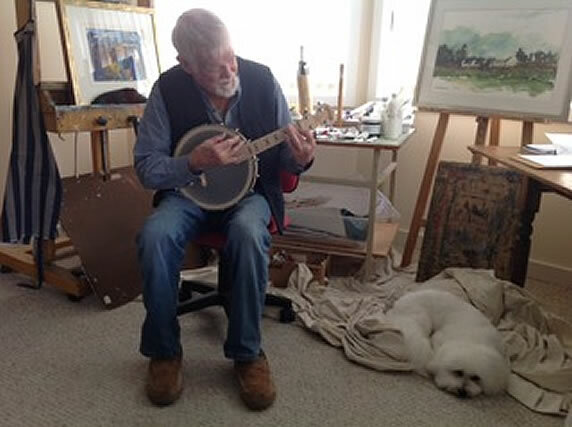 This guitar sounds incredibly good, even when handled by an inexperienced player (such as myself). It’s very loud and projects quite well, and the tone is rich, full and sweet without a hint of harshness to the top end or any sort of dropoff or boominess in the bass. Serial Number: Varies as new; the instrument shown here is 042 and dates to 08/26/14, or August 26, 2014. 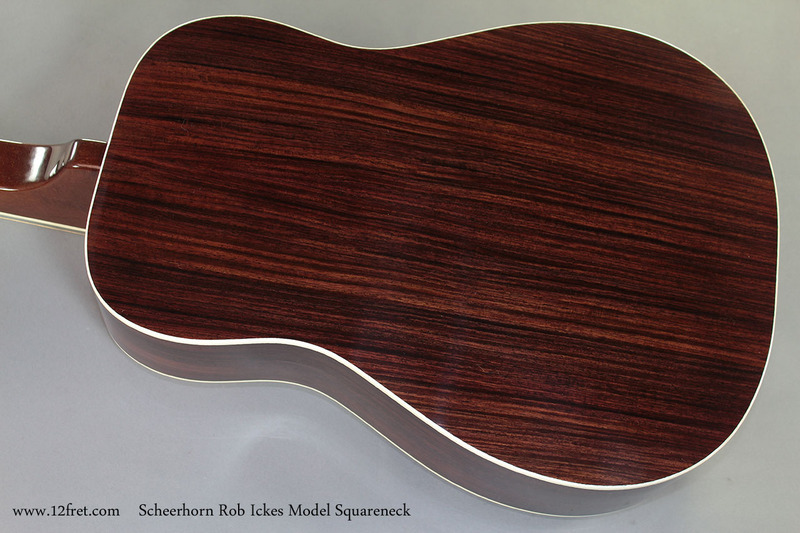 Scheerhorn guitars are built at the National Reso-Phonic facility in San Luis Opisbo, California, USA. Pricing: $5189.00 Canadian dollars with hard shell archtop ‘Canadian’ case by TKL, or $4085 US dollars based on 1.27% exchange rate.